inscription: Bottom edge has: "Reprint from a Cuban poster by the Women's Graphics Collective. 3100 N Southport. Chicago. Ill 60657". The right edge has: "Printed by the Women's Graphics Collective Chicago ILL 60657". Poster has a red background. 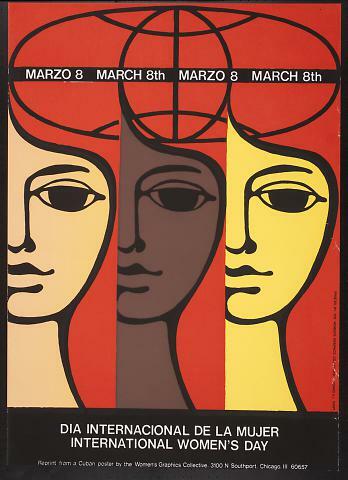 At the top of the poster there is a symmetrical geometric design consisting of a circle inscribed inside an ellipse with two arcs and perpendicular intersecting lines; across the horizontal line is the text: "Marzo 8 March 8th Marzo 8 March 8th". Below the poster contains three stylized female faces. The left side of each is a straight edge while the right side is defined by a sweeping, curving black line that becomes part of the design above. The three faces divide the poster into three equal sections. The face at left is ecru, the face at center is brown and the face at right is yellow. The bottom of the poster has the text: "Dia Internacional De La Mujer / International Women's Day".